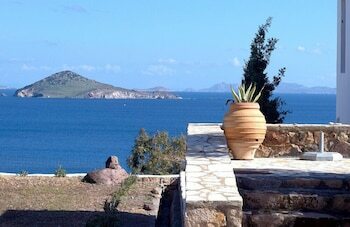 When you stay at Patmos Studios in Patmos, you'll be near the beach, within a 15-minute walk of Meloi Beach and Skala Marina. Free self parking is available onsite. Located in Palekastro, Sunrise Apartments is within a 15-minute drive of Vai Palm Grove and Toplou Monastery. The front desk is staffed during limited hours. Free self parking is available onsite. Located in Skiathos, Margi House is by the sea, within a 5-minute drive of Platanias Beach and Achladies Beach. Free self parking is available onsite.